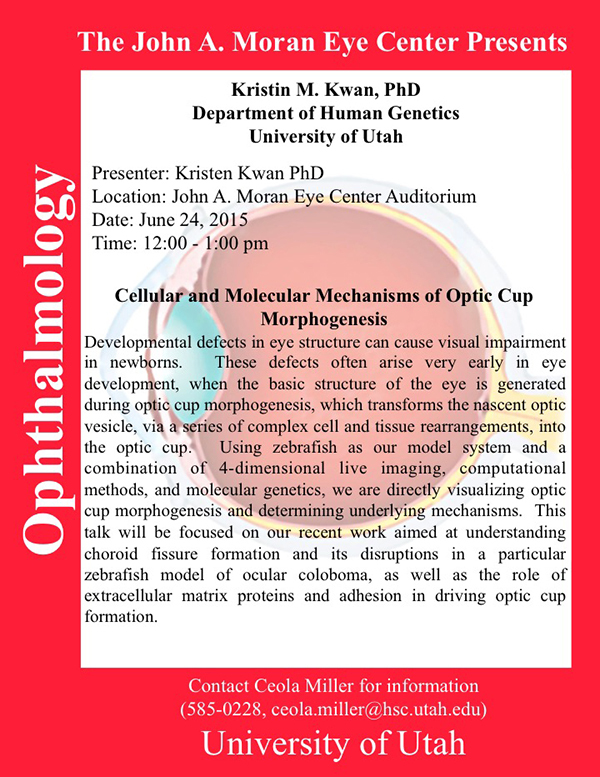 Kristen Kwan, Assistant Professor of Human Genetics, University of Utah will be delivering a seminar on Cellular and Molecular Mechanisms of Optic Cup Morphogenesis on Wednesday, June 24th at Noon in the the Moran Eye Center auditorium. Abstract: Developmental defects in eye structure can cause visual impairment in newborns. These defects often arise very early in eye development, when the basic structure of the eye is generated during optic cup morphogenesis, which transforms the nascent optic vesicle, via a series of complex cell and tissue rearrangements, into the optic cup. Using zebrafish as our model system and a combination of 4-dimensional live imaging, computational methods, and molecular genetics, we are directly visualizing optic cup morphogenesis and determining underlying mechanisms. This talk will be focused on our recent work aimed at understanding choroid fissure formation and its disruptions in a particular zebrafish model of ocular coloboma, as well as the role of extracellular matrix proteins and adhesion in driving optic cup formation.